Moulik, whose literary works and research have received much acclaim in Russia and India, was awarded the Pushkin Medal in 2011. Achala Moulik, a noted Indian author and former Union Education Secretary was awarded the Sergey Yesenin prize instituted by the Russian Centre of Science and Culture in association with the Moscow State Yesenin Museum. 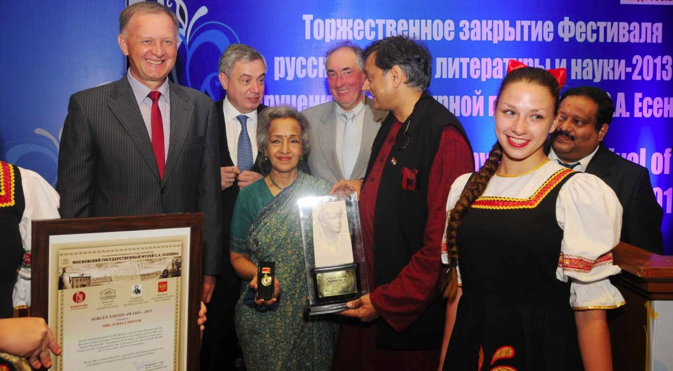 The prize recognizes her contribution to promoting Russian literature in India. The author who has also translated many works of Russian literature into Bengali was presented the award in Thiruvanathapuram, which held a three-month long Russian language, literature and science festival. In 1962 she got her bachelor’s degree from the London University. Her specialization was economics, political science and international law. At the same time she attended lectures in the London School of Slavic studies. Since then Moulik has written many books about Russia, including her research paper “One hundred years of Tolstoy from the Indian perspective” and her play “Pushkin’s last poem,” which was presented in Moscow in 2009, when Russia was celebrating the year of Indian culture. “I used to write about Russia when information about this country was very scarce in India. I wrote about monuments, literature and Russian culture”, she said. “Next time when I visit Russia I would like to see the white nights,” Moulik emphasized. In 2011 she was awarded with the Pushkin Medal for her contribution to the development and strengthening of Russian-Indian science and cultural ties. First published in Russian by Euronews.